Spring 2019 Textbooks must be returned no later than 5pm on Saturday May 11th. 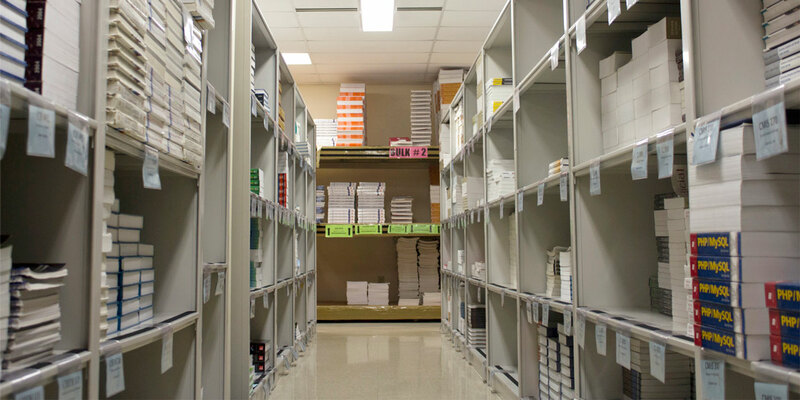 Textbook Service is a textbook rental program that has been part of SIUE since the inception of the university. The rental program provides an economical alternative to purchasing most textbooks as the fee for the rental program is included in the student fees that are charged to all enrolled students. No matter how many books are needed for class, they will be provided to the student at no additional cost so there is no need to bring any money to get the required textbooks needed for classes. For additional information about the textbook rental system please view our Textbook Service FAQ page. Students must have a current valid Cougar Card and be enrolled in classes to pick up their books. Students will need to come into Textbook Service and scan their Cougar Card at one of available stations, a list will printout with the books that are required for classes as well as the location of the books. The student will then need to go collect the books from those locations and bring them to one of the checkout stations where a staff member will check the student out and assign the books to the student. If a course requires digital media such as inclusive access, e-book, on-line help and so on that media will be distributed via the students blackboard account or by the individual courses instructor. Students are strongly encouraged to bring a backpack or some other type of strong bag with them when they pick up their books to make carrying their books back to their vehicles much easier and to protect the books in the event of inclement weather. Students enrolled in off-campus classes have the option to have their textbooks mailed to them and can do so by following the directions in the Off Campus Textbook Form. For more information concerning off campus textbook ordering please visit the Textbook Service FAQs. Privacy laws require that the student and no one else pick up their books. Monday thru Friday from 8:30am to 4:30pm closed on Saturday and Sunday. Textbook Service will have extended and limited hours at various times during the semester. Those hours will be posted here and on our social media platforms. Textbook Service would like to remind everyone that all textbooks must be returned no later than 5pm on Saturday, May 11th to avoid the cost of your books being charged to your student account. Don’t wait until the last minute to return your books! Textbook Service is open Monday through Friday from 8:30am to 4:30pm with extended hours beginning Monday, May 6th. Avoid the lines and help out the SIUE Cougar Cupboard and fellow students at the same time. Bring at least five (5) canned food items (any items) and you can skip the line and head directly to the first available return station. As an extra incentive, if you bring in at least five (5) of the following high priority food items not only will we allow you to skip the line AND we will shelve your books for you too. Textbook Service is located at 200 University Park Drive, Room 1121 lower level. When returning or picking up books, students who are driving should park in Parking Lot P-4. No student parking is available at the Textbook Service building as only vehicles with Green or Blue parking permits are allowed to park in the buildings parking lot. From Parking Lot P-4, cross the street to the sidewalk leading to the rear entrance of 200 University Park. Once inside the building, follow the hallway signs to the correct entrance. Visit the the Find Us page for more directions. All textbooks must be returned no later than 5pm on the Saturday of final exams week.